New Zealand from space. Credit: NASA, https://upload.wikimedia.org/wikipedia/commons/e/ef/ISS-42_New_Zealand_in_Sunglint%2C_large_resolution.jpg. As my talk title suggests, the tech industry — including open source — have a strong role to play in contributing to a stronger, kinder, more resilient NZ. I’m going to cover open data, open government, open source — but only briefly, as you’re already experts! — and how it all ties together into something called “civic tech”. And how all of these could and can have an immeasurably positive impact on our communities, our whanau, and as a result, ourselves. I reckon that strong, shared definitions of any term are amazingly useful when talking about it. So first up, it’s probably useful to make sure we’re all on the same page with what I mean when I talk about open data. For the purposes of this talk, we can define open data as any data that’s publicly available, and on an ongoing basis. And “publicly-available” doesn’t mean for a short period of time only. It doesn’t mean for a select group of people. Or with barriers to entry like being charged to access it. It means, quite literally, publicly available. To anyone, anywhere, anytime. Of course, this definition also includes shoddily-made PDFs of council minutes, for example, so the data may be publicly available, but that doesn’t mean it’s hugely accessible, or even terribly useful for many use-cases (not without an amount of resource which acts in itself as a barrier to entry). And it’s not necessarily live data. To put it another way — it’s static, and while it’s still useful to look for past trends and patterns, it’s not useful for any real-time application. It also, very easily, becomes out of date. And one doesn’t necessarily know when that happens. One way to counter this, of course, is to make it machine readable. This can be done by the organisation who’s releasing the data, or by members of the public or other organisations. To use our earlier example of Council minutes, someone might take those shoddy (and often rather buried) PDFs and turn attendance records trapped in them into a spreadsheet, for easier analysis. An even better thing to do would be to also release the data in the form of an API. An open API — that is, one that’s publicly available. With a bit of luck, there’d also be some accompanying documentation about how to use the API, making it nicely accessible, too. This allows people to analyse and pipe the information into just about any form they choose, from maps to apps. Not only is the data the most up-to-date available, but, as we know, it can be used to make realtime, living resources. I know the devs I, er, know far prefer an API to being handed an Excel spreadsheet (which may or may not have become corrupted along the line, too). I hear a lot of puzzlement from people about why on earth one should give away data. After all, data leads to information, which leads to knowledge. And knowledge is power, right? There’s a strong case to be made that data that’s generated by publicly-funded institutions — eg government — should be available to the public who paid for it. Of course, I’m not talking about all data, and certainly not in raw form. We must be very careful around privacy, and not victimising or revictimising people. But there’s plenty of data that can and should be shared. And a tonne of organisations, and research, backing up that open government data is a powerful thing. It enables ordinary citizens to understand better what’s going on in their societies, and make more informed choices about the decisions they, and their elected officials, make. It enables people to push for change — or the status quo — based on evidence, not anecdote, opinion or emotion. Although we know that emotion is hugely important in making decisions. It builds higher levels of digital literacy — since people need to understand the basics (or know people who do) in order to use the data, they have a stronger incentive to learn about it. It builds more transparent government and power structures, enabling people to hold their governments to account (sometimes to the horror of said governments, which is great). And it gets people engaged. Fewer black boxes into which data disappears, never to reappear, means a less cynical and disengaged society. And the more people are engaged in our society, the better. After all, we live in a democracy! And we get to interrogate our gods. Let’s segue into open government, then. I’m not suggesting they’re our gods, but they do have a powerful effect on our lives! Across the world, more and more governments are turning to the principles of open government as they look for how to stay relevant, do more with less, and be more responsive. Open govt, as the quotation says, means that people living in a country have the right to access information about what the government is doing — often in the form of open data. Of course, exactly what people can access, and how, differs hugely between countries, but the principles of open government — transparency and accountability, participation and engagement — remain the same. It’s simple: open governments make for better democracies. It enables the public to better oversee their government’s activities. It empowers the people in that country to be more informed, and potentially more engaged. And it helps push governments to be more accountable, effective and responsive. One of the major international open government initiatives is the Open Government Partnership, or OGP. and it enables faster, more powerful innovation. 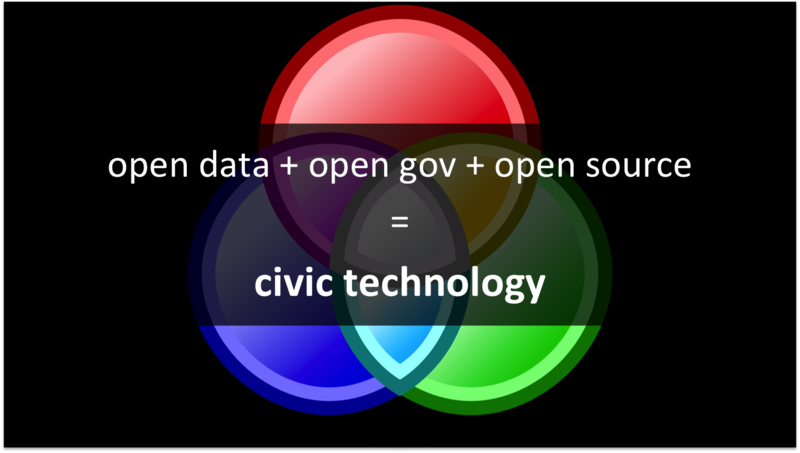 While each of the opens — open data, open government and open source software — can and often are seen as separate things, I believe there’s huge potential for overlap. One of the best of these is in a relatively new movement called “civic technology”. Civic tech means more than just hacking for social good. It’s about hacking civic issues, and finding ways to directly help people. government-to-government (govtech) — improves govt service delivery (Lab+). Medway Bridge in Christchurch after the 2011 earthquake(s). Credit: Schwede66, https://commons.wikimedia.org/wiki/File:Medway_Bridge_76.jpg. As many of us remember clearly, Christchurch was rocked by a series of major earthquakes in 2010 and 2011. While the 2010 earthquake caused damage, nobody was killed. In 2011, however, when our restless land heaved again, 185 people were killed and there was even more structural damage caused to a city already battling. Imagine having skills in open source coding and open data — as many of you do — and wondering how best to help the people of Christchurch? Their solution was elegant, and inspired. They set up a local instance of the open source disaster response platform Ushahidi — initially developed in Kenya to monitor election violence. Ushahidi means “testimony” in Swahili. Combining that with open data, and crowdsourced information, they were able to spin up eq.org.nz within a matter of hours, helping Christchurch people to contribute to and find out, on a map, what was going on in their city, how to navigate it, and where to access essential goods and services. The web app attracted 70,000 visits in the first couple days after the quake, with 779 reports in 781 different locations. It was shut down 3 weeks later, once power and normal comms channels were fully restored. It’s a potent example of how open source knowledge — especially when combined with open data! — can contribute enormously in times of crisis: faster, using fewer (often costly) resources, and helping reduce the load on already overstretched services. One of the groups working at GovHack Wellington 2017. Credit: Lisa Ng, Lisa Ng Photography. The second example I’d like to mention is GovHack. For those of you who are — please bear with me a couple of minutes. For those of you who aren’t…it’s the southern hemisphere’s largest open data / open government hackathon (I’m presuming you all know what a hackathon is :P). It started as a small civic hacking slash protest project in Australia in 2009. People there were…irritated…that some of them were being threatened with legal action, BY government departments, for using public government data. It’s grown somewhat since then; both the public and private sector are involved with it and, in some cases, actively on board! In 2015, GovHack came to NZ as well. And every year it gets bigger, both here and in Aussie. This year, it took place in 8 locations across NZ, and a further 27 across Australia. Hundreds of people in NZ — and thousands in total — came together to use open government data to design, prototype and build solutions to civic issues they saw around them. The range was huge — from apps addressing the housing crises and liveability, to access to swimmable water, to matching volunteers with charities, to industry diversity and concentration across NZ, and a bunch more! And because we believe that open is best, any code produced by the projects must also be open source. Check it out — you can go see the project descriptions, datasets used and code for yourself! The Sunflower Movement, Taipei, 2014. Credit: kirby wu, https://commons.wikimedia.org/wiki/File:Sunflower_Movement_DSC_8748_(13282347593).jpg. Finally, let’s move to Taiwan. We’re all familiar with open source communities and how they work :) Now, can you imagine a community group based on those principles? On flat (or no) hierarchies? On staying agile, and being collaborative? On building together? That’s g0v — East Asia’s largest civic hacker collective. Founded in 2012, it really took off in 2014, however, during the sunflower movement — a student movement which occupied the Taiwanese parliament’s surroundings during 23 days. The sunflower movement’s an amazing example of an Occupy movement which created lasting, positive change. And g0v was a huge part of it, and continues to make significant contributions to improving Taiwan’s civic life and democracy. Their aim, as they say, is to fork government . To do that, they’re constantly creating new open source tools for things like visualising budgets, and thinking of ways to build a more participatory democracy — check out the link to see the full range! It’s called vTaiwan, and uses a mixture on online and in person tools to gather people’s feelings on issues, and give them real power when it comes to making policy. vTaiwan is an experiment, of course, and the initiative is having difficulty scaling up to a nationwide level. But there are powerful lessons we can learn, nonetheless, from both g0v and vTaiwan. As you can hopefully see from just these three small examples, there is huge potential for those of us in the open source community to contribute to our society, even outside of the open source community itself! Open drives progress. It can build amazing things. I believe that de-escalating scarcity as a source of power — encouraging open data, open government and open source — can only be a good thing. As we know with open source software, the power should be in what one DOES with it, not keeping it in a proverbial locked safe. There are umpteen case studies throughout history of the enormous value generated when information is shared, remixed and built upon. Civilisation itself is one of them. Open source code — and open source ideals, known and spread by open source communities! — have a huge part to play in making more open societies. More transparent. More free. More informed. More engaged. More truly powerful. Do we want stronger New Zealand, that looks after her people and her environments, and that’s envied around the world for her kindness and resilience? We can help build her. We can help build a better world. As open source people, we have the keys. See other blog posts we’ve written here about civic tech. Check out my #openX flipboard, into which I save some of the stuff I see about #opendata, #opengov and #civictech, and a bit of #opensource.